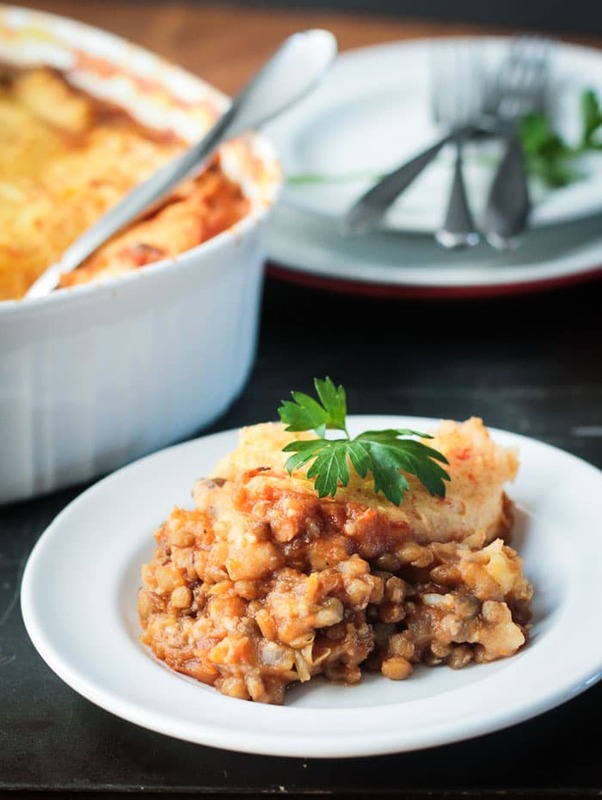 Vegetarian Cottage Pie made with lentils, butternut squash, cauliflower and spices in a rich savory tomato sauce and topped off with creamy carrot mashed potatoes. 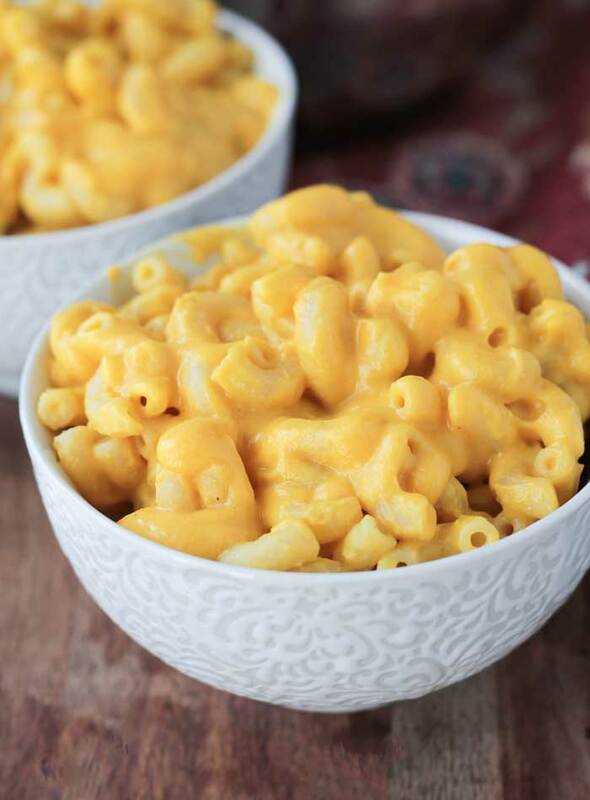 This is comfort food at it’s best, and it’s healthy too! Grab a spoon and dig in! Cooler temps and and a sun that sets earlier and earlier every day calls for comfort food. I made this Vegetarian Cottage Pie last winter and remembering how much I loved it, I knew I had to make it again as soon as the weather started to change. It’s full of healthy vegetables baked in a savory sauce and topped with creamy mashed potatoes with a twist. Vegan and Gluten Free! Grab a spoon! Cottage Pie is typically made with ground beef, or ground lamb in the case of Shepherd’s Pie, with a crust of mashed potatoes. Generally, you’ll find onion, carrots and sometimes peas mixed in with the beef. Well, we don’t do meat around here, so I’ve used lentils in my version. I also switched up the veggies to make it more interesting, using butternut squash and cauliflower – two of my faves! I do love carrots though, so opted to put them in with the potatoes which gives them a slightly sweet element that’s so good! 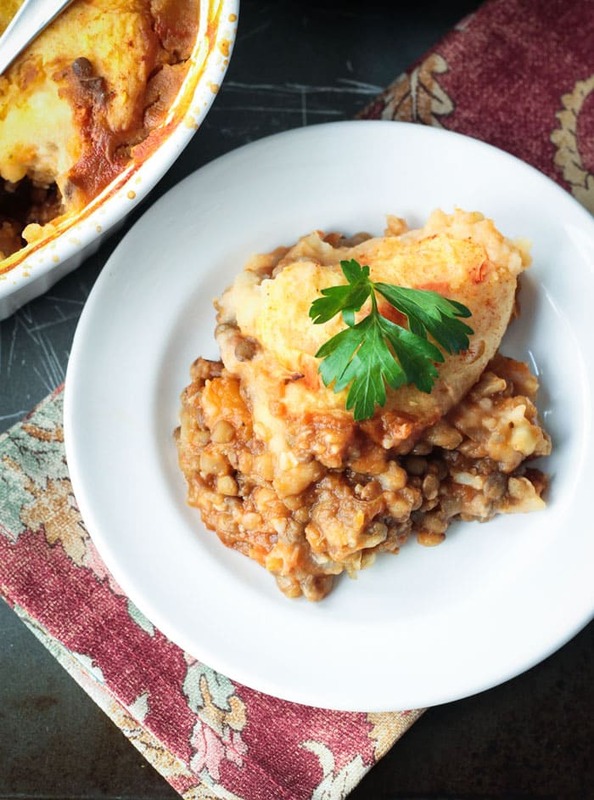 Cottage Pie was originally created to use up and reinvent leftovers. And it still works perfectly that way today. You could easily make the lentils ahead of time and even the squash and cauliflower. If you make the potatoes in advance, you may need to add some plant milk, heat them, and whip them up to get them fluffy again. You could even make the entire casserole a day or two ahead and then pop it in the oven when you’re ready for dinner. You’ll need to bake it longer than the recommended 20 minutes if you are starting from cold. And if you end up with leftovers of this Vegetarian Cottage Pie, consider yourself lucky because I think it’s even better the next day! I hope you enjoy this Vegetarian Cottage Pie as much as we do. If you try it, please come back and leave me a comment below with your feedback and star rating. 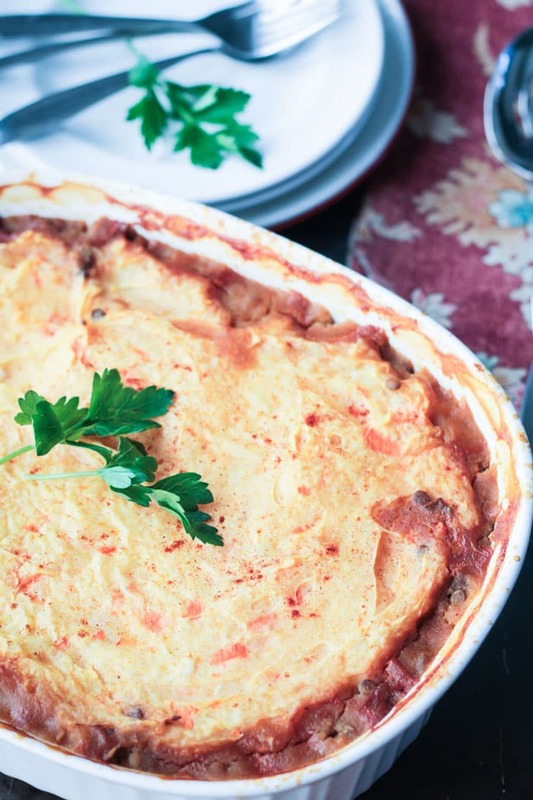 This Lentil Vegetarian Cottage Pie is the ultimate comfort food. Savory and satisfying, it's the perfect meal to warm you up. And you can feel good about it because it's healthy too! Place the potatoes and carrots in a pot of water (enough to cover). Cover, bring to a boil, reduce heat and simmer 15-20 minutes until the vegetables are very soft. Drain and return to the pot. Add the minced garlic, olive oil and salt. Using a potato masher, mash the vegetables until smooth (the carrots may not get as smooth as the potatoes and that's ok, just do your best to mash them as best as possible. Place butternut squash and cauliflower in a pot and add enough water to cover the vegetables. Cover, bring to a boil, reduce heat, and simmer about 15-20 minutes until tender, but not mushy. Drain. (You can do this step at the same time you are cooking the potatoes and carrots. In a large pan on the stove, heat 1/4 cup of vegetable broth. Add the onion and garlic and sauté until translucent, about 6-7 minutes. Add more broth 1 tablespoon at a time if they start to stick. Add the tomato paste, worcestershire sauce, tamari, thyme and salt & pepper. Stir to combine and cook another 2-3 minutes. Add the remaining vegetable broth, lentils and squash/cauliflower mixture and stir to combine. Simmer for 5-10 minutes until the mixture is thick, but saucy. *To cook lentils - add 1 cup of dry lentils to 2 cups of water. Cover and bring to a boil. Reduce heat to med-low and simmer for 15-20 minutes until lentils are tender, but still a bit firm, not mushy. Leftover lentils work perfectly in this recipe, so make them ahead of time to save time (and pots) on the day you make this Cottage Pie. This looks delicious! Do you think it would freeze well? Hi, Alexis. I haven’t tried freezing it, but I think it would work just fine. Let me know if you try it! I liked this! While we are definitely not a no-meat family, I am trying to cut back significantly on the amount of meat we eat. As have others, I adapted this to my family’s tastes, cutting the lentils in half and adding an equal volume of ground meat. I changed the vegetable to the ones I normally put in Shepard’s pie (green beans or broccoli), but I did use the carrot mash, excellent idea! Next time around I am thinking of putting in ground turkey and see if that will go over well. Perfect! So happy to hear this, Bella! By all means, adjust to your tastes. I love the sweetness the carrots bring to the mashed potatoes…glad you enjoyed that! Thank you so much for stopping by!! another fantastic recipe! I edit some baked mushrooms to the filling ? Thank you it was delicious! Thank you!! Mushrooms would be excellent in this! My kids are finicky about those so I don’t use them too much, but I would love that! Great suggestion! I’m so glad you liked it! As always, thank you for stopping by to leave your feedback. Much appreciated! Have a great week and Happy Thanksgiving! One of my favourite cozy dinners. I love the additions you’ve made to the potatoes in the topping. It sound so tasty! Mine too! Such comfort food! Thanks, Mel! What a beautiful meal, I want to make this weekly for a long time. Oh my goodness, this looks so good! A perfect cozy dinner for the cooler weather we’re having now. Thank you so much, Mary Ellen! It’s going down as one of my favorite meals ever. I can’t stop eating it! I just keep making it again when we run out!! LOL! Looks delicious, Jenn! This is perfect for Thanksgiving! Perfect for Thanksgiving – a no food coma! 🙂 Thanks, Amy! 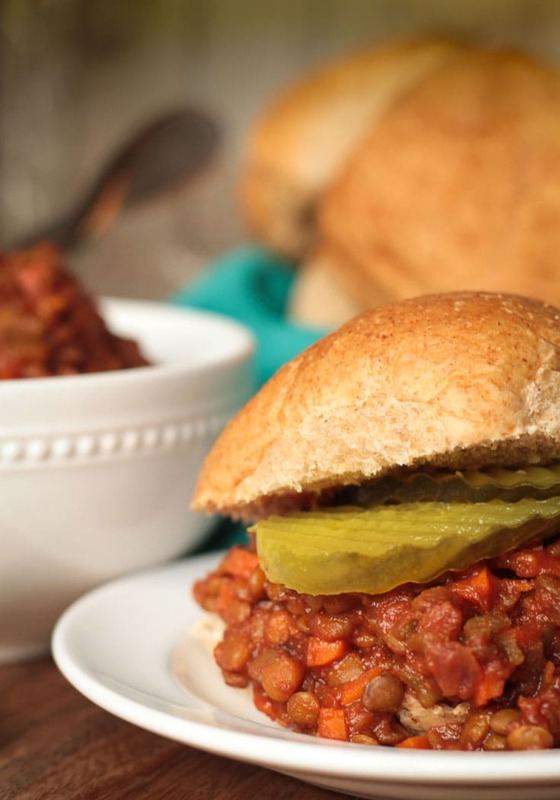 Lentils are a perfect stand in for ground meat! 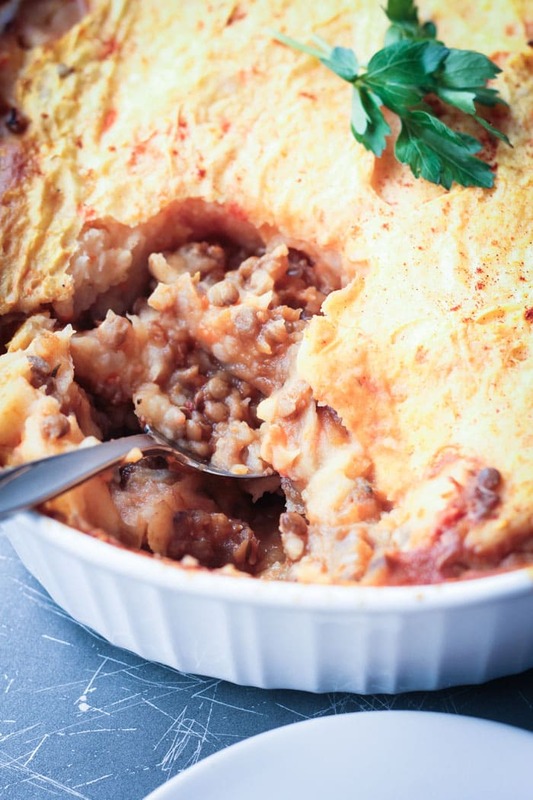 I make a shepherds pie with hash browns on top—gotta try it with your mashed potatoes! Looks delicious! Oh, hash browns are an amazing idea! I bet they get super crispy on the top. Yum!! Thanks, Sarah! This looks like total comfort food. We usually make shep pie with tofu, but I want to try your recipe next time! Tofu is a great idea too. Never thought of that actually. Thanks, Becky! 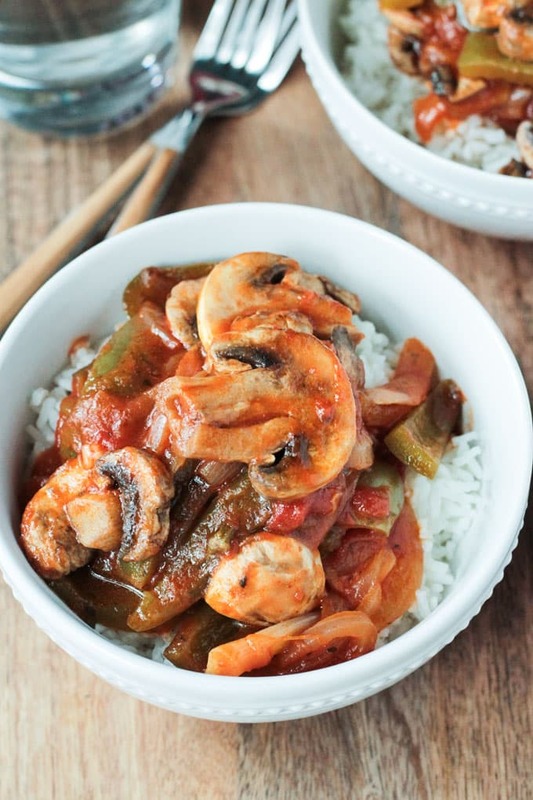 This looks so hearty and warming, and I love how many vegetables you packed inside of it! Thanks, Cadry! The more, the merrier right?! I love cottage/shepherd’s pie. It’s one of my go to dinners. Comfort food at it’s best! Definitely comfort food. I can’t get enough! This looks so warm and comforting! I bet it would be a great main dish for Thanksgiving! Thanks, Dianne! I think it would be perfect for Thanksgiving! I feel like I’ve learned a lot from you this year…so many recipes I hadn’t heard of and now cottage pie! This totally speaks to my savory loving soul! YUM! What a hearty, comforting dish and I love that you added the carrots to the potatoes. This look fabulous!!!! Awww, thank you so much! I love hearing that. I think cottage pie is an English dish, but it’s pretty common here in the States too. Probably better known as Shepherd’s Pie around here, but they are really interchangeable. It’s so cozy and comforting – I can’t get enough! Enjoy! There seems to be some information missing in the “Potatoes” part – it says “1/4 – 1/2”, but not of what ingredient…Can you please let me know what it is? Thanks! Looking forward to trying this recipe! Thanks for catching that, Ingrid! Those numbers shouldn’t have been there at all. Even double checking multiple times before hitting publish sometimes isn’t enough. Ha! Thanks again. I hope you enjoy this one! Ah! I was going to ask the difference between cottage and shepherds pie! Now I know….but it doesn’t matter 😉 PLAT POWER! I think the words are used interchangeably these days, but they did start out different. 🙂 Thanks, Rebecca!